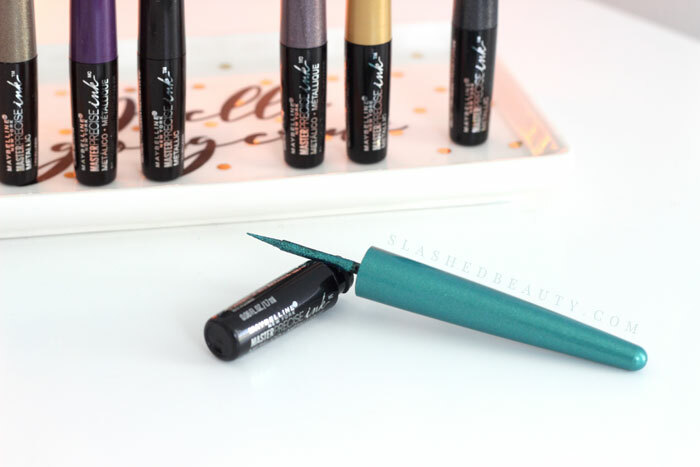 A few weeks ago, I gave you a taste of the new Maybelline launches that centered around the metallic trend. The Matte Metallics Lipsticks were a product that at first underwhelmed me, but once I altered my application technique I had a change of heart. 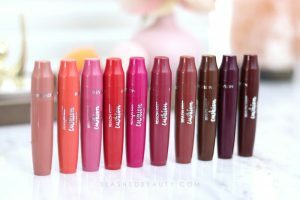 Well, that seems to be the trend with Maybelline’s recent releases, as it was the same story with the new Master Precise Ink Metallic Liquid Liners. 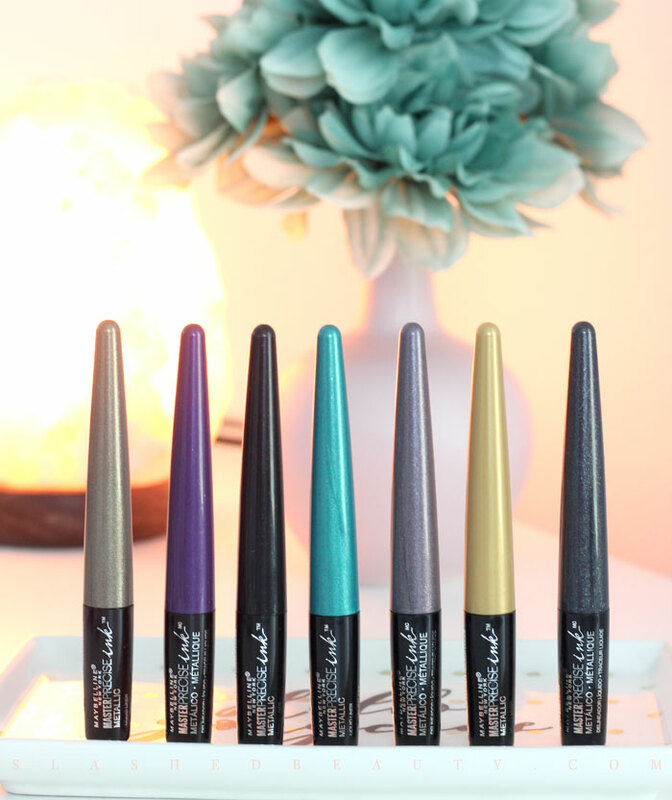 The Maybelline Master Precise Ink Metallic Liquid Liners launched in seven shades to add a bold finish to any look. They feature a super fine felt tip that is long and flexible, offering maximum control and precise application. 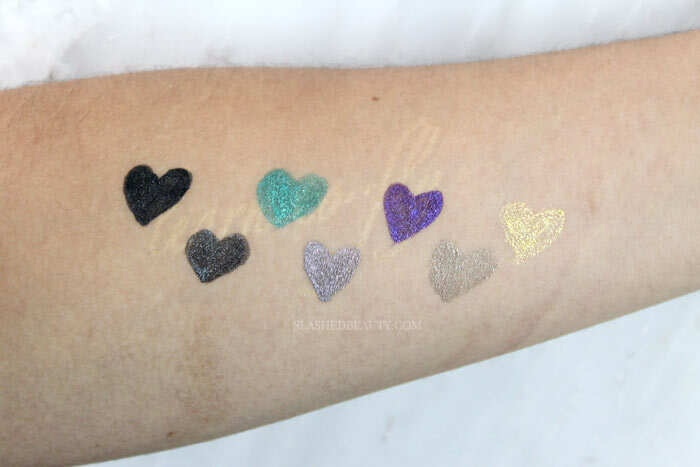 I love this for my signature cat eye, but also for any graphic liner looks you want to create with the metallic pop. I’m not a huge fan of felt tip liners only because over time, they start to fray. It’s been about a month and these are still in good shape and applying evenly, though. Shades shown from left to right below. The first time I used these, they looked nothing like the swatches you see above. They were watery, with more shimmer and hardly any pigment. I let them sit in a drawer for about a month before trying again. When pulling them out for the second time, I heard a little shaker ball inside the liners. I decided to give them a good shake, and voila. So much color! The only exception was Solar Gold, which is not what I consider a true metallic gold. 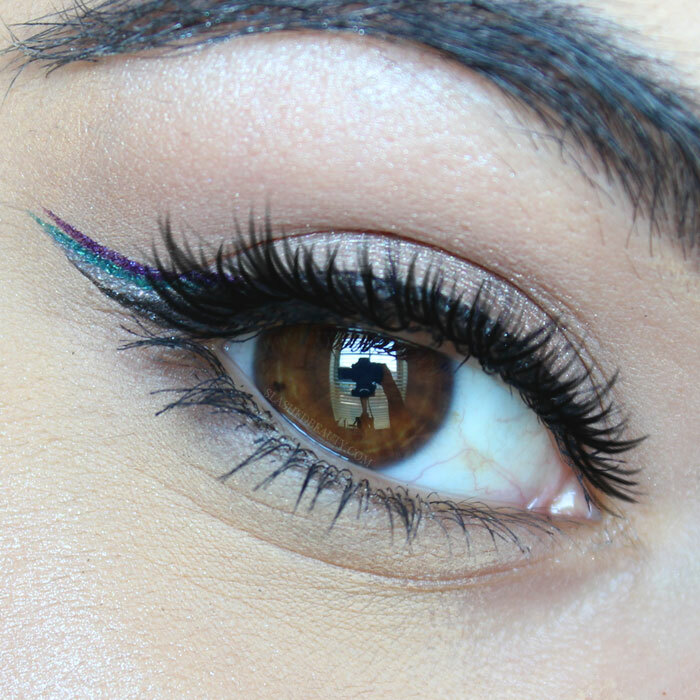 It’s more of a glitter liner— pretty, but not metallic. These have a formula that’s on the thinner side, so if you apply too much at once you might run into a feathering problem. As long as you go slowly and carefully, it shouldn’t be too much of an issue. The shaking also helps the consistency, so that is definitely the trick for getting these to perform their best. I wish they printed SHAKE FIRST in large print on the handle or something! It made all the difference! 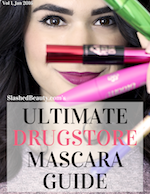 Maybelline boasts that these have a 24-hour formula that’s waterproof and smudge proof. Despite them being so liquid, they do dry down and set very well. Check out the video at the top of this post to see the smudge test: with moderate rubbing, the only thing that got picked up was glitter. The color stays put, though is easy to remove with normal makeup remover. I would definitely trust it for summer activities or any day I need my makeup look to last. These are such a good example of why sometimes a snap judgement on a product can turn out to be unfair. I ended up really enjoying a few of these for creative looks, like the one above where I layered shades in a multi-colored winged liner. I would say the bold shades like Teal Galaxy, Violet Nova, and Cosmic Purple are definitely worth picking up. Solar Gold was a total let down (not metallic, just glitter) and the others aren’t particularly unique in my collection. You can find the Maybelline Master Precise Ink Metallic Liquid Liners at Ulta Beauty for $8.99. Have you tried any of the new Maybelline metallic launches yet?